A series of AI products, care.ai, developed by YITU Healthcare can be used to diagnose cancer and collect big data. Based on several years of practice, a CT-based lung cancer detection and screening system has the abilities to support doctors at different hospitals in China by watching CT scans, making diagnoses and producing structured reporting automatically. From May to the end of July, 2018, a total of 10 residents in Zhuhai and Yufan districts in Guangzhou, Guangdong Province were diagnosed with lung cancer by this AI technology. 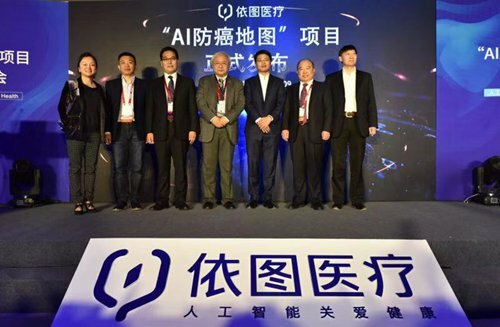 "With a wider use in the medical field, AI is turning out to be an ideal assistant and the second brain of doctors," Ni Hao, CEO of YITU Healthcare said. "We hope that through efficient efforts, we can help find cancer in the early stages for more patients, and make contributions to public healthcare in China," Ni added. Supported by the National Health and Family Planning Commission of the People's Republic of China (CPC) and the Ministry of Finance, the project of early detection of cancer in urban areas of China has been listed as a focal point with the Nation's major public health services. "AI could give reliable support to detecting cancer early," Liu Yulin, the chief physician of Hubei Cancer Hospital said. When it comes to early cancer detection in remote and rural areas in China, Ni said that choosing the 19 provinces, cities and autonomous regions which have been included in the project at this time, matches China's relative policy. We will give technological and economic support to each region in China where there will be a plan to promote early cancer detection.